plaisir de france revisite Catriona Irving"sitting on the shef whithout shelly"
this package includes light blue 7 inch vinyl of Sitting On The Shelf EP, download code, badge pack and T-Shirt (choose size at bottom of the page). Catriona Irving is well-known for her ability to thrive on self-reliance. She's already had two successful 7 inch releases featuring songs focused purely on the sound of guitar and voice, she's been called “a classic example of DIY music at it's best” by Fact , and she also co-owns and runs her own record label; Need No Water . So it may be a surprise to those following her career so far that this release is the first in a trilogy of EPs with a new focus on collaboration. The idea started by building on songs that Catriona had been writing with her friend Philippa Latimer. Catriona was so excited by the material that resulted from this approach that she decided to work with Dale Grundle of The Sleeping Years on two of these songs; title track " Sitting On The Shelf Without Shelly " and " Untitled " . Together they enrolled the talents of two other The Sleeping Years members ; Alex Beamont on Cello for " Untitled " and Tom Page on drums for " Sitting On The Shelf ". 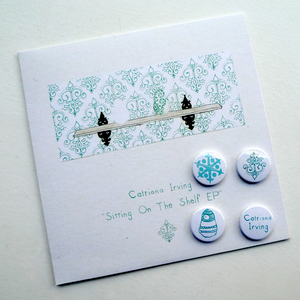 Taking further inspiration from the collaborating sensibilities of Belgian friends Soy Un Caballo , who have released split singles with Tunng and This is The Kit on Catriona's label this year, Irving embraced the welcoming nature of fellow musicians in Europe. She recorded “ Untitled ” in Brussels with Thomas from Soy Un Caballo and put their vibes to good use for the track in the process. While the focus of these tracks is still firmly on Catriona's voice and her gift for melody, the extra layers of instrumentation show a progression into a different sound to her previous releases. Tom's drums on “ Sitting on the Shelf ” propel the song into a radio-friendly toe-tapper, while Alex's Cello on “ Untitled ” makes a delicate but wonderfully melancholic addition to the already fragile love song. Short but spellbinding track “ Measurements ” is included on the EP as a lone solo performance from Catriona, reminiscent of previous releases that fans will love. In a further European connection, Paris-based DJ Julien Plaisir De France ( http://www.myspace.com/julienplaisirde ), picked up a copy of Catriona's first single, “ Running on Empathy” on a trip to London. He loved Catriona's voice and got in touch via myspace, and from then on they kept in contact, eventually leading to the idea of Julien remixing some of Catriona's songs. Catriona sent Julien the parts to one of her and Philippa's songs, " Sitting On the Shelf Without Shelly " and he returned with his remix of fantastically layered vocals, drums and synths, all centered around Catriona's original melody building up into a chopped-up french disco finale! Everyone involved loved the remix and immediately the decision was made to include it on the first of the EPs alongside the original version. The French seem to love the track just as much; thanks to the Parisian connection Catriona's popularity is already steaming ahead in France in advance of the release. Having already been picked up and featured on France 2's documentary " Rendez-vous en terre Inconnue ", the “ Sitting On The Shelf ” remix has already had over 20,000 plays on Fairtilizer.com a very popular site with French music fans, so now it's time for the UK!